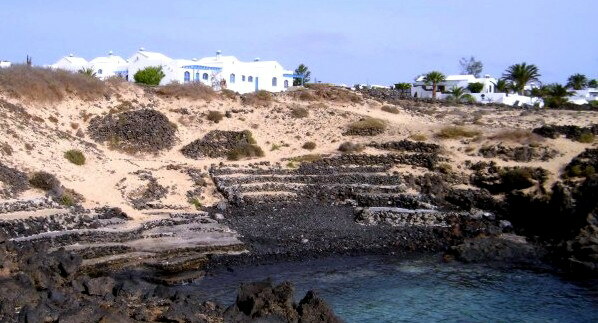 Instead of beaches, Charco del Palo has a rocky coast where several areas have been prepared for swimming or sunbathing. What makes it special is that nudism is allowed in the whole village, for sunbathing, for shopping or for walking along the coast. It is quite far from other villages, so it is a very peaceful place. Follow north the main road in Lazarote. North of Costa Teguise take the exit towards Mala. Since it is not very well signposted, it is easier to find the local farmacy and turn then left into a narrow road. After a few kilometers through this winding road we reach Charco del Palo. It is not a proper beach, but there are two zones in the volcaninc roads prepared to sunbathe and swim. To the south, a few sandy terraces around a cove. To the north, a sea pool whose level depends on the tide. Next to it, an area with stairs and rails so that getting out of the sea is easy (or at least less complicated), because there swimming can be dangerous because of the waves. Nothing directly in the bathing areas, but they are right in the village. You can be naked all around the village. Obviously, nobody uses a swimsuit to sunbathe, neither in the "beaches" nor in gardens or terraces in the appartments. Not even to walk or do shopping... And since Charco del Palo is far from other towns, naked walks along the shore can be as long as you want. Those who have never been in a naturist village before will be surely surprised.